Over the past three months, Greater Lansing Area Clean Cities (GLACC) and Clean Energy Coalition (CEC) have held a series of events to highlight Michigan Green Fleets projects in Detroit, West Michigan, and Ann Arbor. The Michigan Green Fleets program began in 2009 after CEC received $15 million in American Recovery and Reinvestment funds from the U.S. Department of Energy for a multi-stakeholder project. With project partner matching funds, the four-year effort totals nearly $40 million of investment into Michigan based clean transportation projects. As a project partner, GLACC has helped to organize and promote events around the state to inform stakeholders and community members about the Green Fleets program in their region. The Michigan Green Fleets three-part event series kicked off at Henry Ford Community College in July and highlighted clean transportation projects that are happening in the Detroit area. DTE Energy/MichCon used funding through Michigan Green Fleets to purchase nearly 200 compressed natural gas (CNG) service vehicles and install 14 CNG fueling stations that service seven cities across Michigan. The City of Detroit was also featured and is also benefitting from these Recovery Act funds. By this time next year, the City of Detroit will have outfitted eight refuse trucks with hydraulic hybrid propulsion systems. The second stop was in West Michigan at the Kalamazoo District Library. This event focused on clean transportation projects happening at UBCR and Western Michigan University (WMU). UBCR, a Michigan recycling collection company, was able to purchase 16 CNG fueled semi-trucks with Green Fleets funding that will reduce their green house gas and criteria pollutant emissions by 130,000 of pounds per year. UBCR will also have CNG fueling infrastructure in Grand Rapids and Wixom by the mid December. WMU is also making sustainable strides in their fleet by operating numerous alternative fueled and advanced vehicles across campus. Through the Michigan Green Fleets program, WMU has been able to expand their clean transportation portfolio by adding a hybrid electric Ford Explorer and a plug-in electric bucket truck. The last event in the series took place at an Ann Arbor Green Drinks event at the Ann Arbor evening Farmers Market. A brief presentation on Green Fleet projects with City of Ann Arbor and University of Michigan was given followed by networking and one-on-one question and answer opportunities. 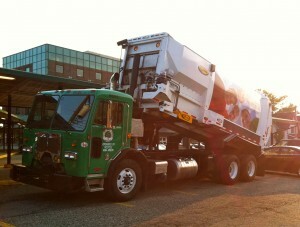 The City of Ann Arbor decided to get involved with Michigan Green Fleets so they could provide their recycling services in a more sustainable way. 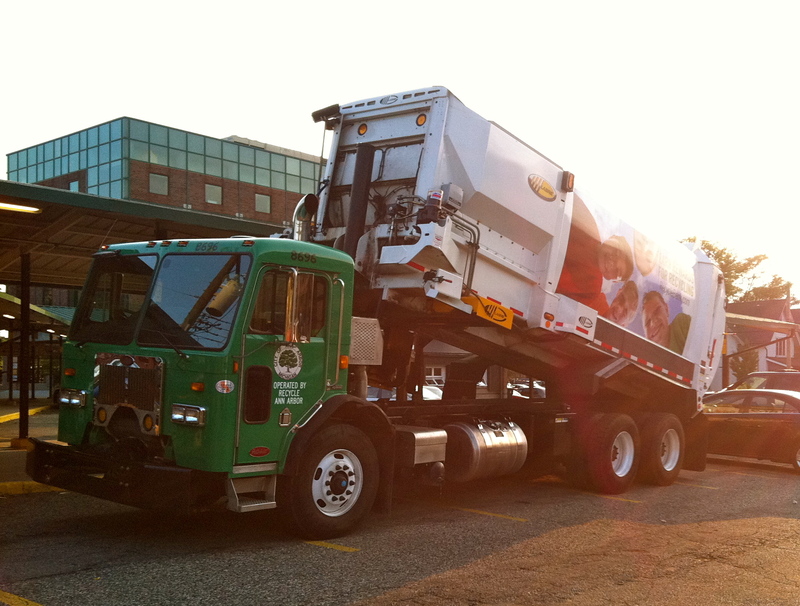 With grant support, the City of Ann Arbor was able to purchase a hydraulic hybrid electric refuse truck that has reduced their fuel consumption by 15% and reduced maintenance costs by $3,000 per year. U of M has also used Green Fleet grant dollars to improve their fleet by purchasing electric vehicles and installing electric vehicle charging infrastructure. Through the Michigan Green Fleets program, Argonne National Laboratory has predicted that 1.5 million gallons of petroleum will be displaced per year- equaling more than 13 million gallons over the anticipated equipment life cycle. In addition to petroleum reduction, new vehicle technologies are being commercialized and jobs to maintain these vehicles and infrastructure are being created in Michigan. More information on the Michigan Green Fleets Program can be found here. 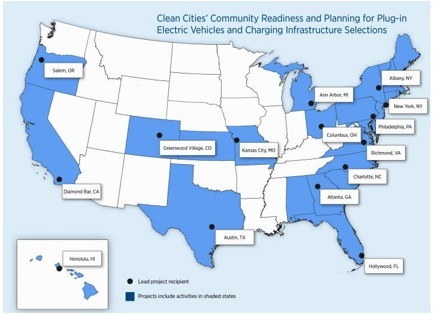 Greater Lansing Area Clean Cities is a Partner on a EV Planning Grant.This grant is part of an $8.5 million dollar investment toward reducing dependence on fossil fuels across the country. By increasing the availability of diverse fuel types for vehicles, individuals, government agencies, and businesses will be better insulated from unstable gasoline and diesel prices in the future. Additional economic opportunity exists in the manufacture of vehicles and equipment to support electric vehicles here in Michigan, as well as through the installation of electric vehicle supply equipment (EVSEs, commonly referred to as chargers). This one-year project will research market potential for electric vehicles in greater Lansing and across the state, identify barriers to installing electric vehicle charging infrastructure, and identify opportunity to overcome such barriers. The outcome of the project will be a plan that can be used by local governments and the state government to assist in implementing actions to overcome barriers to adoption of electric vehicles. Such actions may include updating permitting processes, revising electrical or building codes, training municipal personnel, promoting public awareness, and/or developing incentives. rticipate based on alignment of priorities, challenges, and solutions among alternative transportation options. In September, months of planning resulted in a new draw to DeWitt’s downtown – public charging for electric vehicles (EVs). City officials held a public and press event on September 12 to showcase this new feature to the Bridge and Main intersection. This project began early this year when DeWitt city manager Dan Coss saw opportunity in the fact that DeWitt residents own electric vehicles and neighboring communities are seeing growth in EV ownership. Coss and downtown development authority officials believe that this point of interest will draw in EV owners and others interested in new technology on the transportation landscape. Local EV drivers and those from out of the area will utilize the charging equipment while they shop and dine downtown. The DeWitt charger is listed on the U.S. Department of Energy’s Alternative Fueling Station Locator and the ChargePoint America network to help EV enthusiasts find the site easily. EV drivers in attendance at the September 12 press event stated their interest in visiting DeWitt more frequently now that the charger is available. 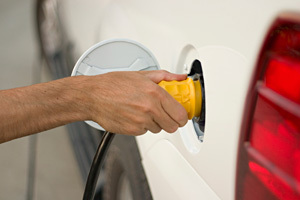 Electric vehicles and charging infrastructure have become a focus of government and industry efforts to increase vehicle efficiency – reducing driver fuel costs and pollutant emissions from burning gasoline or diesel fuel. With the recent availability of EVs from automakers like GM and Nissan (with Ford and others entering the market next year) programs have been implemented to make sure these efficient vehicles have the necessary infrastructure. 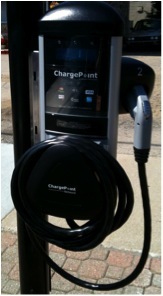 The U.S. Department of Energy funded ChargePoint America project, administered by Coulomb Technologies, provided funding for the DeWitt charger. Other area EV projects include an initiative by Lansing Board of Water & Light to demonstrate and test EVs and charging units to ensure the grid is prepared for growth in electricity use for transportation. Among the many initiatives focused on electric vehicles and charging infrastructure is the Built by Michigan coalition. Built by Michigan consists of groups and individuals interested in supporting Michigan’s manufacturing sector who recognize the important role for advanced vehicles and alternative fuels in Michigan’s economy. GLACC’s mission of improving local air quality and energy security through alternative fuels and advanced vehicles aligns with the focus of Built by Michigan. As a part of this coalition, GLACC is helping to raise awareness about the positive links between clean vehicles and fuels and Michigan’s economy. Learn more at www.builtbymichigan.org. With Built by Michigan partners, GLACC has helped to organize a town hall meeting that will bring electric vehicle industry experts and local groups together to inform the public, elected officials, and other interested groups on the benefits of a clean vehicle economy. This meeting will be held on Wednesday, September 28 at the Lansing Board of Water & Light facility (1232 Haco Dr., Lansing, MI). The event will begin with a ride and drive at 5:00 p.m. followed by a panel discussion from 6:00 p.m. to 8:00 p.m.
Over the past year, Greater Lansing Area Clean Cities has been working hard to displace petroleum throughout the tri-county region. On October 12, we will hold our annual member meeting at the offices of Dean Transportation to give updates on projects and events that have happened over the past year and find out how we can assist your clean transportation goals in 2012. Members will have the opportunity to talk about their organizational priorities and give input on how GLACC can help them most effectively moving forward. Patrick Dean from Dean Transportation will give a keynote presentation over lunch on his partnership with GLACC that has helped to clear the air for school children. After the member meeting, GLACC will hold a special breakout session to better understand barriers and opportunities to the deployment of plug-in electric vehicles (PEVs) in the Lansing area. Over the next year, GLACC will assist mid-Michigan communities is planning for electric vehicle infrastructure. Objectives for this project may include updating permitting processes, training municipal personnel, promoting public awareness, and developing policies related to adoption of PEVs. Information gained from this research will be used to create a plan that will be publicly available so that other stakeholders can learn best practices. Join us on Oct. 12 from 12:30 p.m. to 2:30 p.m. at Dean Transportation’s Training Facility (one building away from Dean Transportation’s Headquarters-map) and give us your input. Community members, local municipalities and any other stakeholder with interest in PEVs is welcome and encouraged to attend. If you have any questions, please contact Maggie Striz Calnin at (517) 925-8649 ext. 13 or by email at maggie@kbsincorporated.com.